Australian blogger Gail of My Fabrication came to London for work this week, and popped in to see me while she was here. Gail works for the equivalent of Transport for London in New South Wales and is particularly concerned about accessible transport issues, especially for people with disabilities. She met me at work where we had a nice discussion about fashions and shops on our different continents. Then I took her to have a good look around the Kings Cross and St Pancras area as I thought she might be interested in the regeneration, and how a transport hub had been brought to life. She liked it a lot and took some photographs. I showed her around the Central St Martin’s college. I felt a bit of a fraud as I had done a similar trip with Sew2Pro a couple of months ago. We considered having dinner at Dishoom, a restaurant that serves the food made famous by the Iranian cafes of Mumbai. Although Gail likes Indian food she said she would really appreciate a salad. After a weekend in Paris where she had eaten a lot of baguettes! So we picked up a few vegetables on our way home. 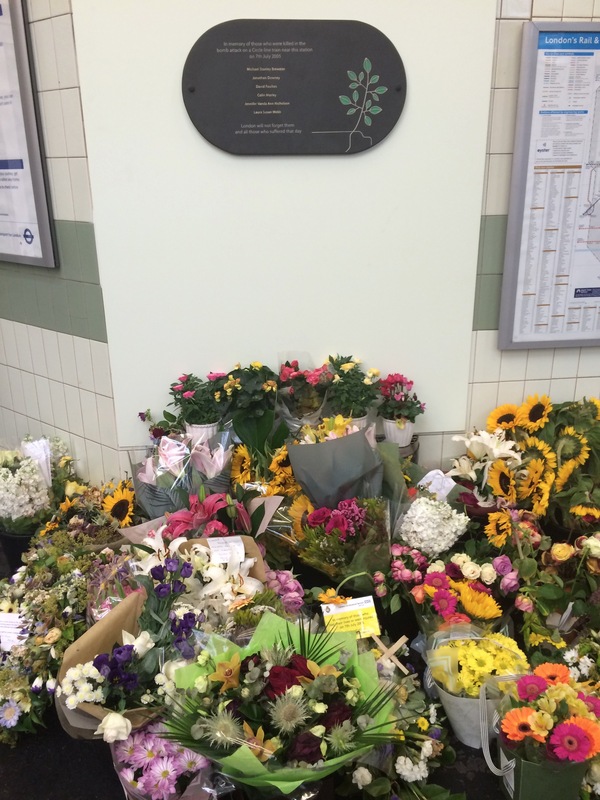 As we arrived at Edgware Road station she commented on the pretty flowers that the staff cultivate within the station. Then we saw a huge selection of flowers piled up against the wall. Gail immediately realised they were to remember the people who had died at the station on 7 July 2005. The smell of the flowers was very powerful and it was a touching moment that we spent looking at them together, remembering that day when people in London were attacked by the bombers. Anyway I rustled up a cold salmon salad while Gail told me about how she had met her husband on a Kibbutz in Israel. She was a socialist and he was Jewish and she chose to become a “Jew by choice”. We discussed our experiences of Jerusalem, and different approaches to bringing children into a faith. Gail is petite, pretty and very nice. 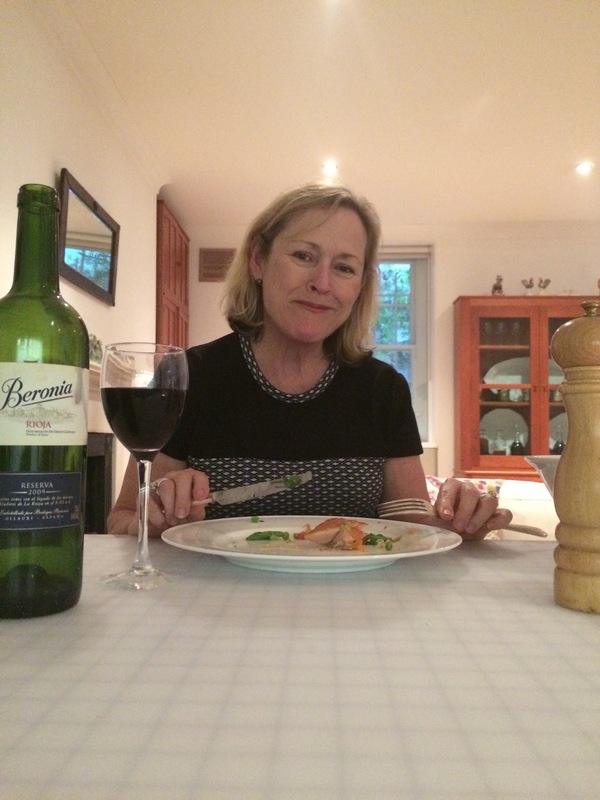 It was a pleasure to have dinner with her and I am pleased to report that Gail enjoys a nice glass of Rioja. We talked about how wonderful Sydney is – the perfect spot to place a city – and compared it to London and Australia to England. She had lived here as a young woman of 19 to 21, so she had lots of insider understanding. She told me she had met up with several bloggers on her last visit to England, and how she knows quite a few of the Australian bloggers. Gail asked me to tell her about fabric printing, so I showed her some of my samples, my silk and other textile paints, and one of two garments I had made. She hopes to try some of the techniques when she gets home. If, like Gail, you fancy having a go at discharge printing , this post might help. I loved Gail’s outfit that she had put on to show me (not yet blogged about). Sadly I had completely failed to choose a handmade outfit that morning. I was wearing RTW I am afraid. I really liked her top and skirt combination (great overlocking) and the really nice silver linked belt she had on (completely invisible in this photograph). Making a skirt and matching top, especially in a comfortable jersey fabric, is a great way to create a smart work look that can be combined differently. We talked about how people dress in Sydney compared to London and I said II told her I liked Australian brands Cue and Veronika Maine. The best bit of our evening was when I showed her an old Schiaparelli pattern I had wanted to acquire, on Ebay, last week. Unfortunately it went for over £100 which was too much for me. But I was intrigued by the lovely two piece blouse which I covet. It was so nice to be able to have a detailed discussion of the construction of this item with someone who was as interested as I was. 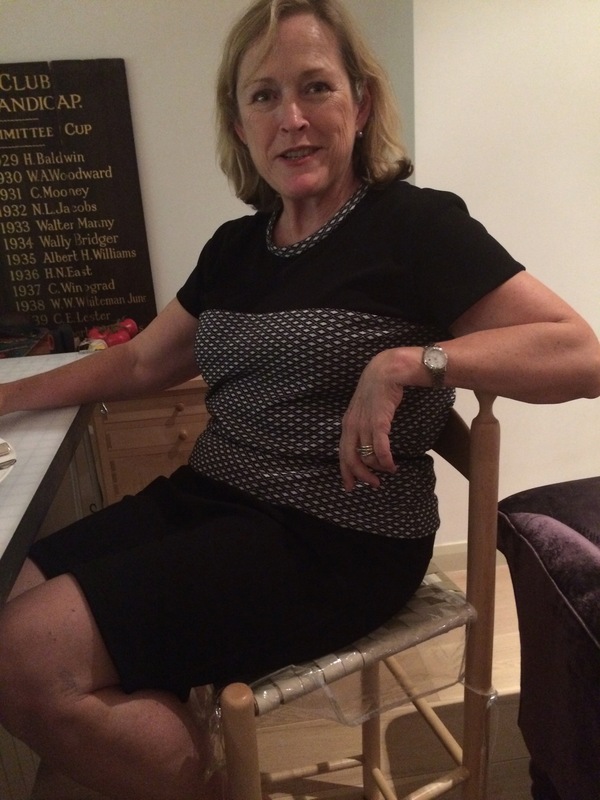 Although the blouse is closed by hooks and eyes on one side, and buttons on the other, Gail thought making it in jersey would avoid the need for fastenings. Good thinking Gail. Just discussing this together was wonderful. 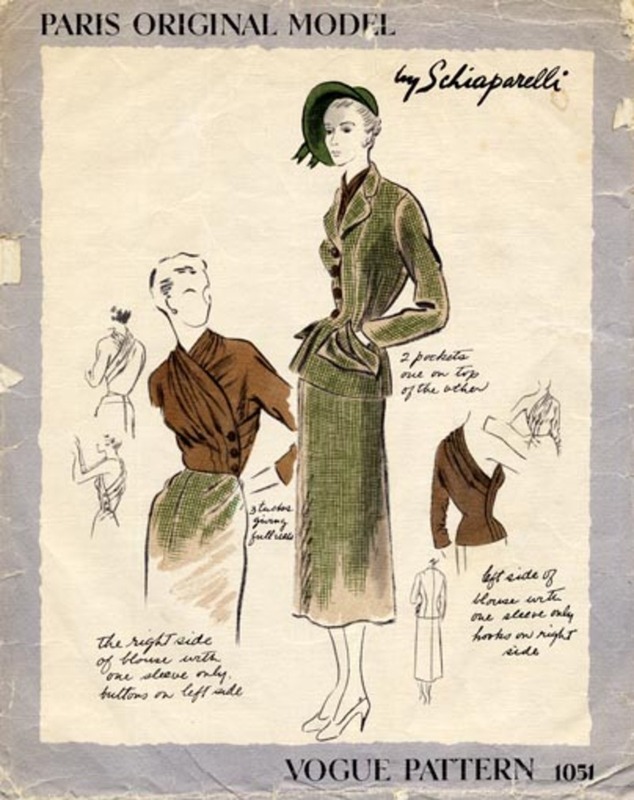 She also told me of a Burda pattern that has a similar, if simpler, version. I would like to know more about that. I felt like we were blogging but in the flesh. Interesting. After all this Gail asked if she could check on my Kondoing, so we wandered around the flat looking at the contents of my drawers! I hope it provided some inspiration (Gail thought I had quite a lot of clothes, which is true! What a fabulous experience! How fun to spend the day with a fellow sewing blogger in person. I’ve also made so many contacts with sewers worldwide and will definitely try and contact those who live closeby on my next trip. The vintage pattern is intriguing and I’ll be watching to see if either of you make some version of the style. Your dinner also sounds amazing. Looks like you both had a lovely day. Fascinating pattern! I don’t think I’d use the one shoulder version as I don’t bother with tops that aren’t bra-strap friendly, but the full version looks like a winner. Hi Kate, It was lovely to meet up with you. From the second photo it looks like I was enjoying the Rioja a little too much. Can’t wait to see the Schiaparelli come off your mood board onto Camilla! Gail sounds lovely and how great to meet people this way!